2018 Weekly Gun Raffle Participants: There is no need to resubmit a new Raffle Ticket Entry Application, as your information is already on file. Simply send your check for the amount of tickets you wish to purchase and your raffle ticket stub will be mailed to you. Send payment to: JRGC Raffle, P.O. Box 501, Jasper IN 47547-0501. Note: Our firearm suppliers no longer have a source for Stoeger shotguns, so the JRGC is substituting different firearms for those previously listed that are no longer available. Week 2A was a Stoeger M3000 Semi-Auto, now a CZ 712 G2 Semi Auto 12 Gauge has taken its place. Week 3B was a Stoeger M3000 Defense 12 Gauge, now a Savage Model 11 Trophy Hunter XP with Nikon Scope has taken its place. Winner’s choice of caliber. Week 29A was a Stoeger Condor Competition, now the Remington Model 870 Express Super Mag Synthetic 12 Gauge Pump Shotgun from Week 47A has taken its place. Week 47A will now be taken by a Savage Stevens 555 O/U 12 Gauge Shotgun. Our next “Bonus Drawing” prize was going to be a Stoeger P3000 Pump 12 Gauge Shotgun, now a Ruger American 6.5 Creedmoor has taken its place. Our 6th “Bonus Drawing” prize will be a Ruger American Rifle in 6.5 Creedmoor. Bonus Drawings are held the first Tuesday after the sale of EVERY 250 Weekly Gun Raffle tickets. Bonus Drawings will continue as long as ticket sales exist. Our 5th “Bonus Drawing” occurred Tuesday, January 1 after the regular 2019 weekly ticket draw. Jerod M. of Huntingburg, Indiana was the winner of the Ruger LCP II .380 ACP Pistol from Weisheit Guns and Gear in Jasper. Ticket Number 11416. JRGC Weekly Gun Raffle tickets are still available for purchase until May 31, 2019. One firearm is added to the drawing for every 20 raffle tickets sold. But why wait that long, get yours today before you miss any more drawings! 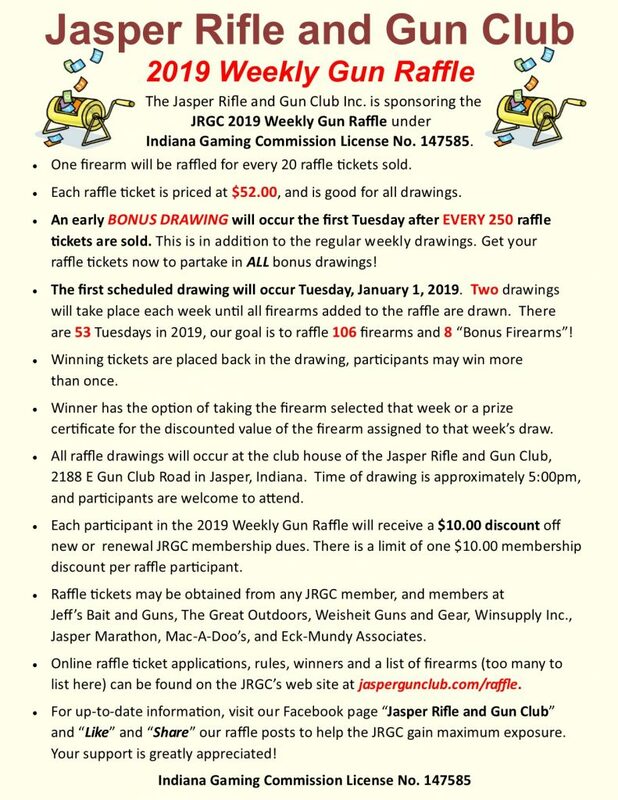 The JRGC 2019 Weekly Gun Raffle is being conducted under Indiana Gaming Commission License Number 147585.